If not for a pretty slow and dull first half, this movie would be great, because the second half is certainly smart and exciting in all the right ways. This is a good film about some pretty important issues that gets way better as it goes on. The first half or so is incredibly dull and boring, but you keep watching for this mega-cast, hoping it will get better. And it does. Much better. In the first half of the movie, we meet the characters and only vaguely start learning about some factors that will contribute to the issue. But in the second half, the movie takes the issue head on. That situation involves the newspaper, (The Washington Post,) uncovering a story about how the government knew the Vietnam war was a hopeless, unwindable cause, and kept sending troops in anyway. The only problem is that publishing this story might be considered treason and illegal, and could end up destroying the paper and winding the reporters in jail. So freedom of the press is on the line, in a movie about whether you can be honest with the readers, even if it means risking your job. All of this makes for a pretty compelling film. The Post is a pretty good movie, although you would never know it from the first half. That’s a weird statement to make, considering that half the film is a pretty significant amount of time. And with another movie, a lousy first half would most likely be enough to sink the entire film. But this one doesn’t just get good in the second half, it gets great. The story comes alive and the tension continues to build. This is a movie that absolutely gets better and better as it goes on. The story here is about a newspaper, the Washington Post, during the time of the Vietnam War. And it’s about one particular issue and situation that the newspaper faced. They received word that the Pentagon conducted a research group about whether or not the Vietnam War would be beneficial to America. Was there even a possibility that America could win the war. The conclusion was absolutely not. And yet, despite knowing this, the Pentagon decided to continue to send troops over there anyway. They did it to save face and not look embarrassed by having to pull the troops out, and admit to their mistake. The movie is about the decision at the newspaper, over whether or not to publish this report. It comes with some dire consequences, such as knowing full well that it has the potential to land some of the people reporting on it in jail for treason. The first half of the film, for some reason, goes nowhere near this issue. Instead this time is completely focussed on the different jobs at the paper, and the finances of running it. We hear about a royal wedding, and which reporter will be covering it, and meet the owner of the paper, Kay Graham, (Meryl Streep.) She is dealing with issues involving stocks and ownership and finances, and none of it is very interesting. We also learn that another competing paper, The New York Times, has a story that the Washington Post wants to know about. They send a spy into the Times office to try to find out more. Only nothing comes of this. This story doesn’t pan out. The spy doesn’t find out anything, and instead of getting a satisfying end to that story, the Times just comes right out and tells the Post what they are working on. How anti-climactic can you get? The first half of the movie spends time introducing us to bit players who work at the paper, (the young reporters,) and basically fall off the map in the second half. They are suddenly nowhere to be found. Considering that the movie was directed by the great Steven Speilberg, and considering how great the second half is, one can only imagine that there was an agenda and some reasoning behind making the first half in this way, but it’s certainly not easy to figure out what that agenda could have been. But then we get to the second half, which really starts with one of the reporters, Ben Bagdikian, (Bob Odenkirk,) being brought in to where copies of the government findings are being kept, the movie suddenly takes off. It’s like a completely different film. Now there is an actual debatable issue on the table, and our characters must come to terms with which side of the issue they are on, and the reasons why. Some of the factors at hand are that the New York Times has been told they legally must stop pursuing and writing the story. Doing so will be considered against the law. And that’s most likely why the Times has given the story to the Post. They want to see another newspaper write it and pave the way for pursuing stories like this to be acceptable and legal. But the woman in charge of the Washington Post, Kay, is the one who will take all the blame if the government courts decide that this was indeed illegal. It’s her neck on the line, and so the hardest (and final) decision is really hers. The paper belongs to Kaye. Her father left it to her husband, and when her husband died, it became hers. She’s living in a man’s world where she is the only woman at the table on a number of occasions. There’s even one scene in the movie where she walks up the steps of a building to see tons of women lined up outside, waiting for something. Kaye walks passed them all and into. the building. Turns out there are all secretaries, and they are waiting for their bosses who are inside. Kaye walks into the building and if surrounded by men. She is the only woman in the room. All of this is important, because Kaye is out to prove a lot for both her paper and for women. She is constantly undermined by men in this film, (such as a board member, played by Bradley Whitford.) They can’t believe a woman is running the paper. Even Kaye’s own father, leaving the paper to her husband, and not to herr, is insulting. And Kaye just deal with this and consider these factors when making her decision. She knows that if the Post publishes these Pentagon Papers, than not only can she possibly wind up in jail, but she might destroy the paper completely that her father helped create. On the other hand, if she does publish them, them this story has a potential to put her paper on the map in a way that it never has been before. The movie does something very smart in giving us a villain. This is Robert Macnamara, played by Bruce Greenwood. Macnamara isn’t a bad guy, per say, but he is the one who knew the findings of the study, knew the war was hopeless, and continued to send troops over anyway. He’s the guy who the papers are writing about, and he’s also a major character in this movie. Giving a face to the enemy is important for a movie to do, and this one makes sure to do that. Things get especially spicy when the issue of Kaye’s friendship with Macnamara comes into play, and she realizes that if she publishes the story, it will mean possibly sacrificing that as well. 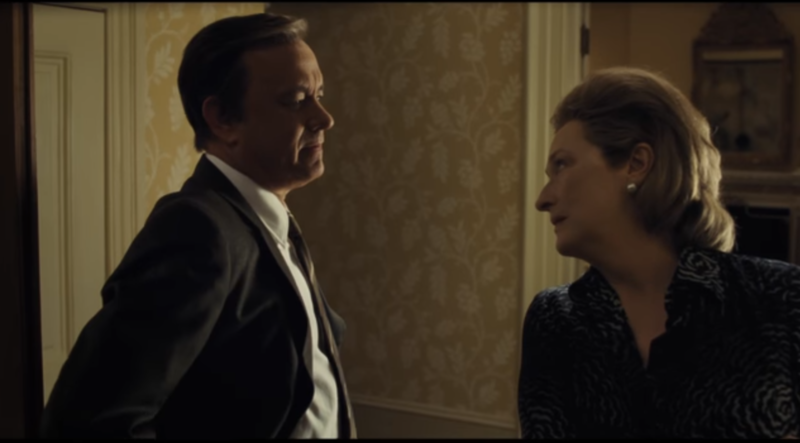 The Post is an important movie. It’s a movie about Freedom of the Press. 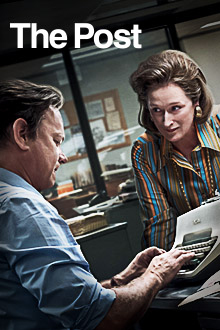 Tom Hanks plays Ben Bradlee, the reporter who really supports publishing the story the most. He’s the guy who invites all of the other reporters into his home to start going through the papers, one by one, looking for things that they can use. But the movie belongs to Meryl Streep., and she knocks it out of the park. There are some pretty fascinating debates here, and lots of lawyer involvement as the characters try to figure out what to do in the situation. Are they loyal to the fans and readers or are they loyal to their readers and fans? That’s the question and issue characters are facing in this movie. If only the first half was stronger, this could have been a very good film.